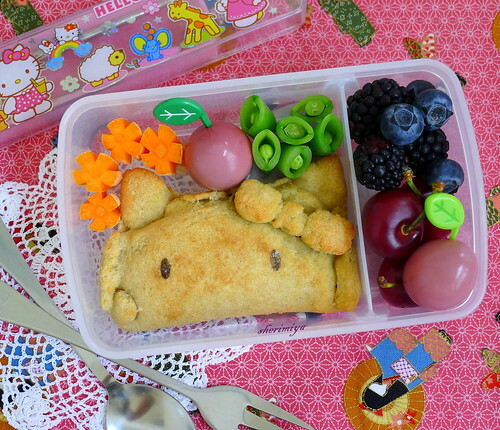 Hello Kitty Calzone Bento, a photo by sherimiya ♥ on Flickr. Oh, and by the way, The Huffington Post Kitchen Daily ran a bento article today, with a mention and a shot of my Hello Kitty Pizzawich Bento in there. Happy Little Bento represent! 1. In a medium-size bowl or the bowl of your food processor, place the flour, xanthan gum, yeast, sugar, and salt and stir to combine. 2. To the flour mixture, add the 3 tablespoons of olive oil and the water in a steady stream, either pulsing in a food processor or mixing with a spoon or fork to combine. If you are using a food processor, pulse while streaming in the water, until a ball begins to form. Otherwise, stir constantly while streaming in the water and continue stirring until the mixture begins to come together. If the dough seems super sticky, add some more flour a tablespoon at a time, and stir or pulse to combine. Press the dough into a disk. 3. Place the dough in another medium-size bowl and drizzle it with olive oil. Turn the dough to coat it with oil. This will prevent a crust from forming on the dough while it is rising. Cover the bowl with plastic wrap and place it in a warm, draft-free area to rise until doubled in volume (about 1 hour). 4. After the dough has risen, wrap it in plastic wrap and chill for at least an hour before rolling it out. 5. To make pizza, roll between two pieces of plastic wrap. Create a crust by rolling in the edges, brush the dough with olive oil, and blind bake it at about 400 degrees F (that is, bake it plain, before topping it) for 5 to 7 minutes, sot he crust begins to crisp. Then, top it with sauce, cheese, and whatever else you have in the fridge, and return it to the hot oven until the cheese is melted, another 5 to 7 minutes. Looks yummy! I love Hello Kitty and bentos so this is perfect for me :). Love that you made it HK! So cute!! I've been working on my own calzone recipe bc I haven't had much luck with a few I've tried. Looks like this one works well, tho! :) Love it. I've backed off on the pizza and calzones because the gluten-free versions are so different. They really take a lot of getting used to (for me). Once I let go of what I imagine the dough should be like, I think I'll have an easier time with it. How's that for the psychology of gluten? Heh. when I make GF dough, it's very glue-y textured. I like that this recipe can be patted out and shaped! I think I'll give it a try - haven't had a calzone in forever! Yes, it's sticky and gluey for sure. She suggests rolling between plastic wrap, which I think helps. I use wet fingers to pat out the dough. 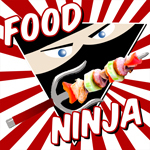 I hope you try it and that it works for you! My kids love calzones and pizza so I really should get used to this strange kind of dough. Adorable--just love a cute filled bread in bento context! I can see her and it's no surprise that TinySprite loved her! You're inspiring me to step the game up with my own kids actually... my packed lunch sandwiches won't really do after this!